Be patient for this recipe. As long as you can hold up for 6 hours while the house is filled with aroma from the soy sauce based stew, the end result will be satisfying and fulfilling. 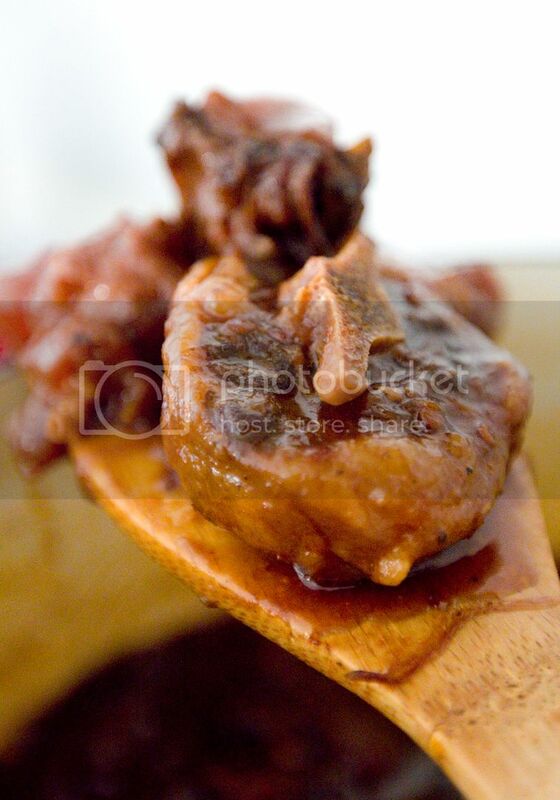 You'll be rewarded with fork tender beef tendon along with fall out of the bone ox tail. 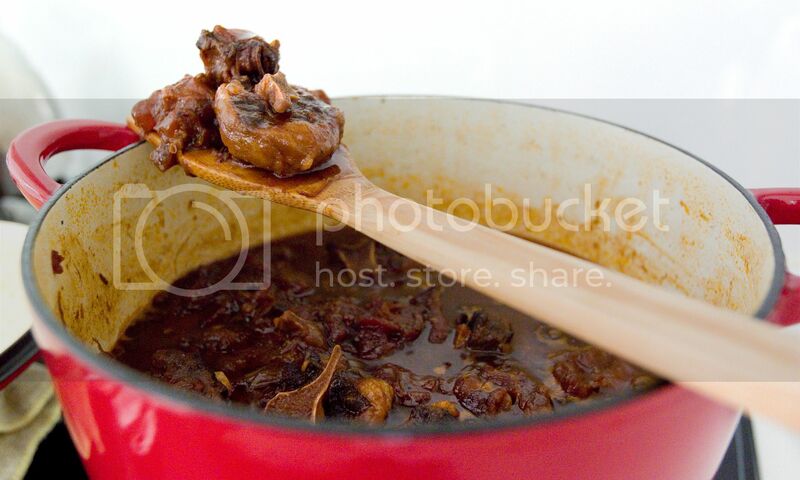 Chop the beef tendon into bite size pieces and transfer to a big pot along with the ox tail. Pour in some water and bring to a boil to draw out the dirty impurities. Don't let it boil for too long, about 2 minutes. Drain and set aside for later use. Peel and chop the onion into large pieces. Peel the garlic cloves. Chop the tomatoes into large cubes. 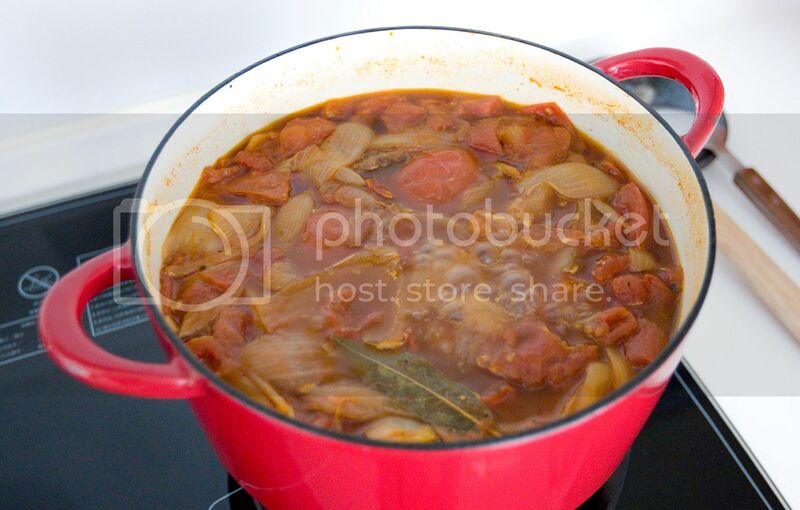 Make sure to use a big pot since this stew requires large amount of liquid to begin with. Drizzle some olive oil into the pot and add in the salt and freshly ground black pepper. Slowly stir fry the onion for about 7 to 8 minutes till almost caramelized or turns slightly browned. Add in the fresh tomatoes and stir fry for about one minute. Pour in canned diced tomatoes together with the juice inside, also add in the tomato paste, soy sauce, condensed soy paste, and water. Let it cook for a couple minutes then transfer the tendon and ox tail to the pot, gently stir the mixture. Add in the scallion, garlic cloves, and bay leaf. Bring to a boil then lower the heat to keep it simmer. 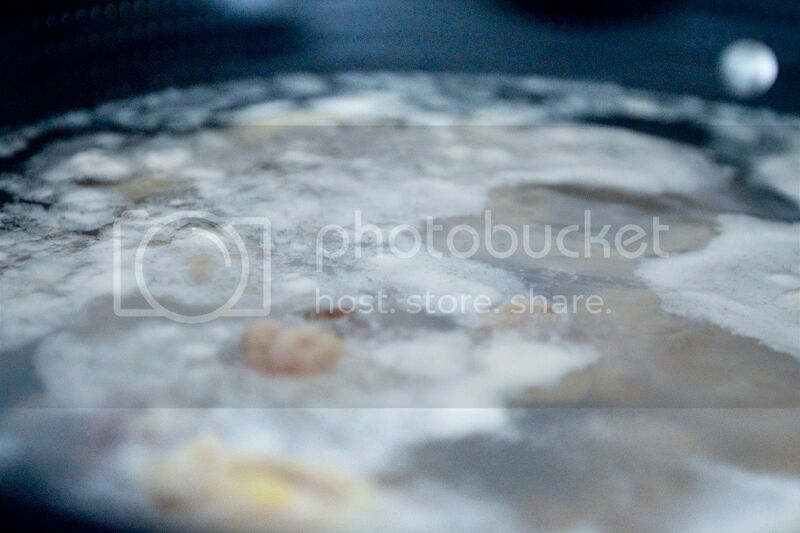 Make sure to scoop out the remaining dirty impurities floating on the surface. 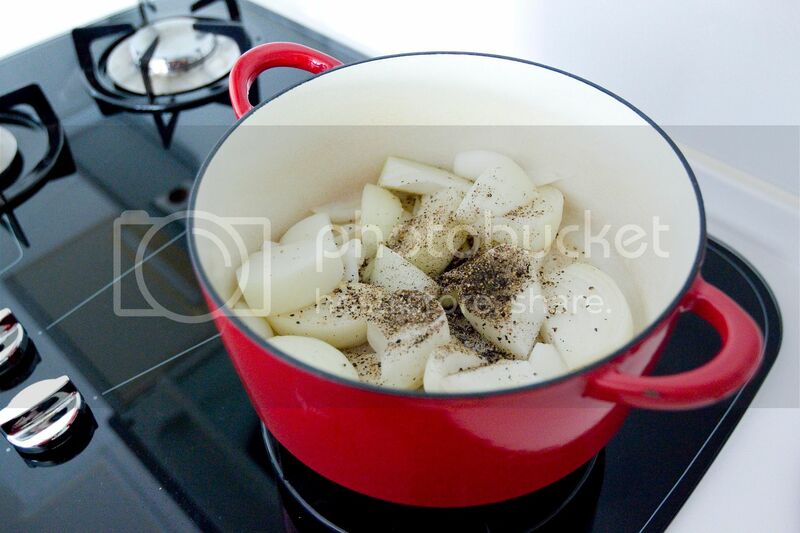 Check often in the beginning and you can simply leave the pot simmering afterwards. Put on the lid and let it simmer for six hours. Please check once a while making sure nothing is burning on the bottom or the liquid has been dried out. Do not bring up the heat for the purpose of reducing the the liquid as soon as possible. The tendon takes a long time to cook through, so just keep the mixture slowly cooking at its own paste. The stew tastes better overnight. You can make ahead and store the whole pot into the fridge. Just heat it up with small fire once ready to serve. Even though it's more of an Asian style stew, but besides steamed rice, its flavor actually works quite well with pasta. Mashed potatoes will do the trick also, just need some kind of starch to complete the meal. 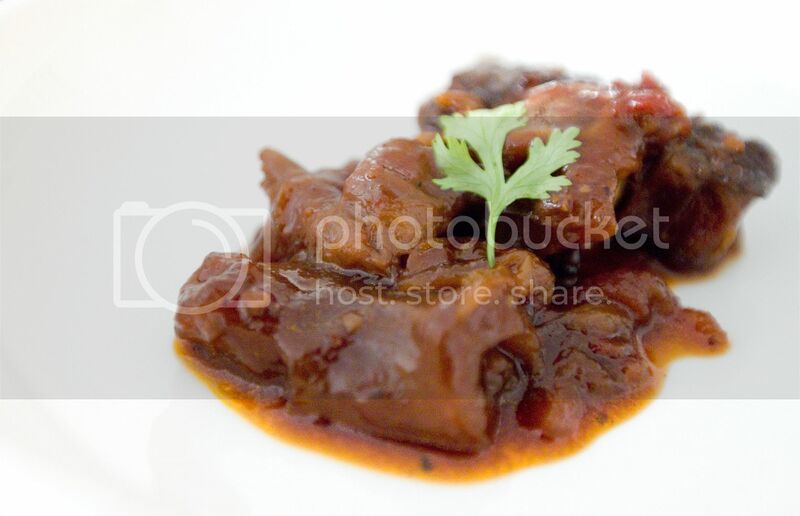 Oxtail + tendons...loving the "gelatinous" consistency of this dish. Gelatin, that's the word! Somehow I keep thinking glutenous haha~!